Hello, friends. 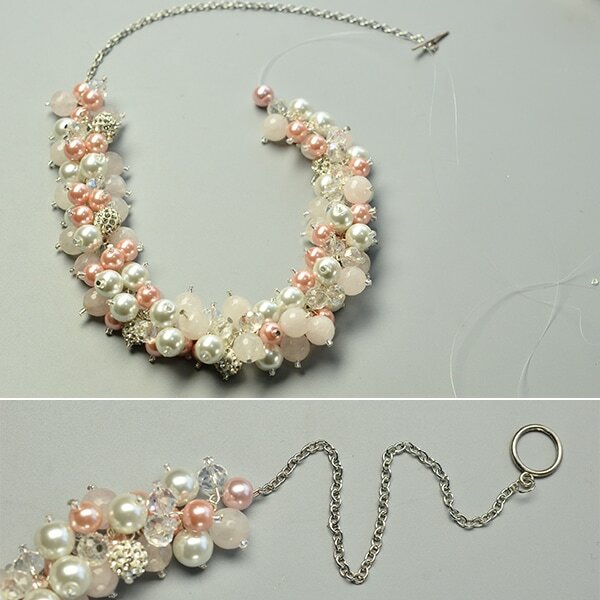 Do you want to make a simple beaded bracelet? Now, look at below picture. How do you think of this Tibetan charm bracelet with crackle glass beads? Like this one? 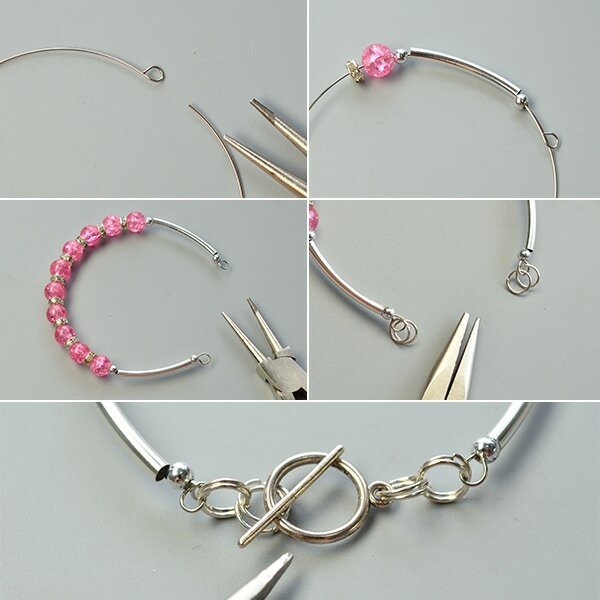 If yes, you can follow me to learn how to make this cool charm bracelet. Fourthly, add jump rings onto the two loops and attach the Tibetan toggle clasp and Tbar onto the jump rings. Secondly, add the heart charm and snowflake charm onto the jump rings to finish this Tibetan beaded charm bracelet. ​Now, see it now clearly. Do you like this cool and casual style bracelet? 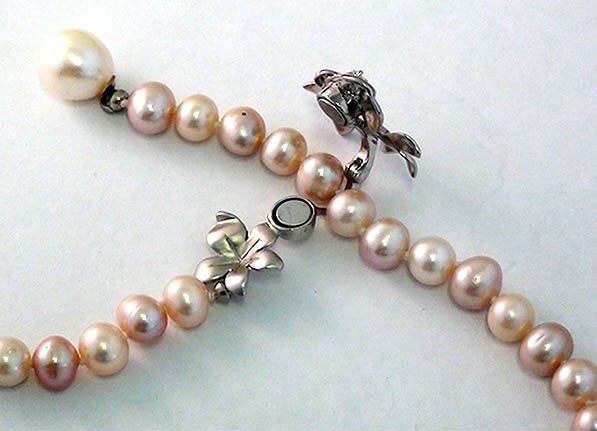 You can add you favorite charms onto this bracelet making, then share us your crafts. See you! Love gemstone pendant necklace? 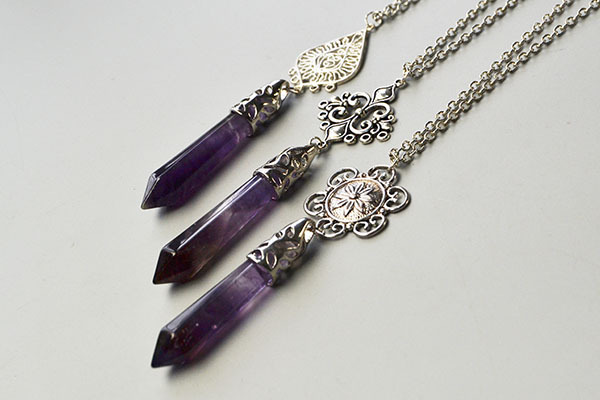 Here I will show you an amethyst pendant necklace. If you also like amethyst jewelry, then you can follow me to see the details in making this amethyst gemstone pendant necklace. 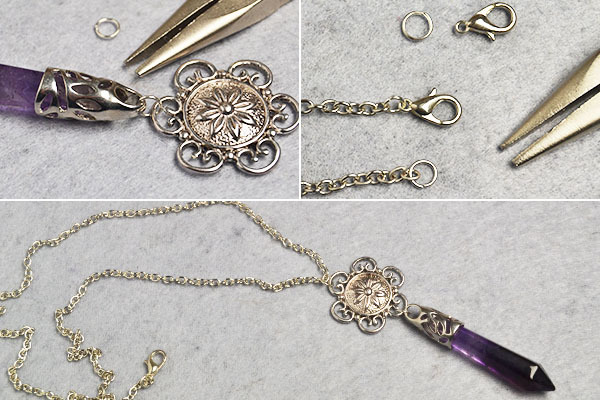 Step 1: Hang a flower component link to a amethyst gemstone bullet pendant through a jump ring. Step 2: Prepare a long piece of silver cross chain and add a jump ring to one end while add a lobster clasp to the other end of it, then hang the dangle pattern to middle of this cross chain as pictured. Here is the final look of the amethyst gemstone pendant necklace. Look! I made other 2 such gemstone pendant necklaces with different component links, do you like them? The amethyst gemstone pendant necklaces are so easy to make that even you have no DIY skills, you can make them quickly, then do you wanna join me and to have a try? Anyway, hope you a wonderful day! ​In looking at a range of magnetic clasps, we begin with a round-shaped platinum-toned design that is made of brass. With a size of 15 by 10 millimeters and with a hole of 0.5 millimeters, this piece comes at a price of $1.42 for two pieces. Packages can be purchased in lots of 50 pieces. 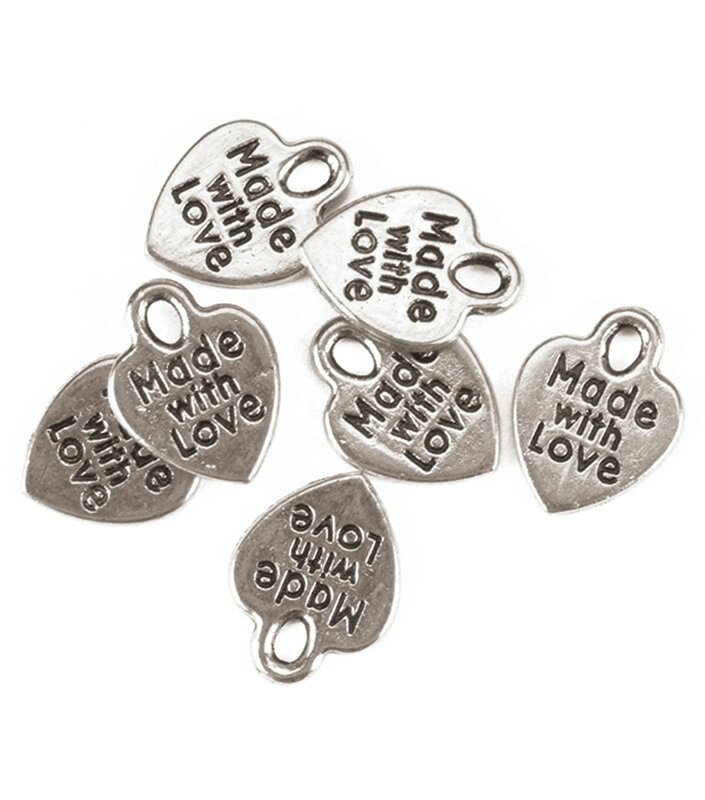 Checking out another brass design, this time in a silver tone, you have a piece of 17 by 10 millimeters and in the shape of a heart which costs about $1.77 for five sets. Also in brass are magnetic clasps of oval shape and gunmetal tone with a size of 11 by 7 millimeters and a hole of 1.5 millimeters. This set costs about $14 for 100 of them with further discounts on offer for regular customers. Now, we look at a standout color of golden in another oval shape and the same dimensions of the previous one. This costs $1.20 for five sets. Moving on to small lots, we see the largest number of designs in stainless steel at about 274, followed by brass at 88, rhinestone at 50 and alloy at 37. There is a single model in porcelain. Looking at this sole porcelain model, it is column-shaped and with a platinum finish. The size of the model is 9 by 4.5 millimeters and the hole is sized 1 millimeter. It is priced about $1.65 for five sets. ​The next shape that we see is also a column made of 304 stainless steel and in stainless steel color as well. At 21 by 9 millimeters with a hole of 5 millimeters, it can be bought at $2.04 for two sets. A very beautiful flower made of alloy Rhinestone and with a silver tone has dimensions of 41 millimeters by 14 millimeters and costs $2.90 for 1 set. You have to purchase a package of 20 sets. A “Hot” model is one made of alloy, round in shape and with crystal AB on a silver tone. It has a size of 21 by 14 millimeters and is priced at $12.22 for 20 pieces. Closing our look-through, we see a top seller piece, of which there are more than 400. These are rectangular Tibetan style pieces made of ally and in an antique bronze finish. The size is 18 by 15 by 11.5 millimeters and the hole is 10 by 7 millimeters. The price is about $24 for 50 pieces. 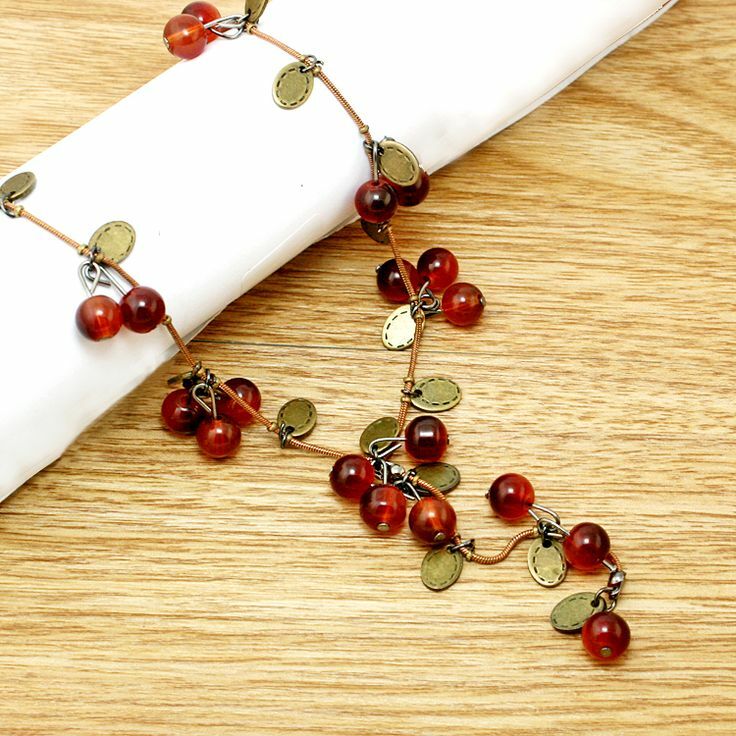 ​Tibetan Beads are available categorized as general, dZi and other. Within the dZi category, Tibetan Agate is the material that is used. A model made of natural agate in a size of 10 millimeters and with a hole of 2 millimeters is making a major impression. A strand of 38 pieces of this model which makes up a length of about 15 inches is priced at about $25 for five strands. Among the Other category, a hot model is handmade oval links that comprise brass findings with bee wax. With an antique silver appearance, these also cost the same as the previous model but for just four pieces. Looking at another sample in the Other category, you can opt for handmade pendants with coral in the shape of a drop. This one costs about $12 for 10 pieces. 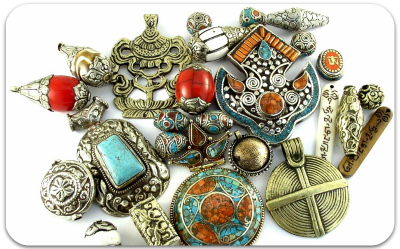 Looking at the standard Tibetan beads, there is an antique silver model made of alloy in a round shape. This 8mm-sized piece costs about $1 for 20 pieces. Among the standard category, there are many finishes to choose from with cadmium free & nickel free & lead free one of them. The metal color options are aplenty such as antique silver and antique rose gold. Looking at one of antique rose gold pieces, you see alloy beads shaped as a helmet and costing about $31 for 200 pieces. Checking out some pieces of mixed color, you see a lion head model at about $23 for 150 pieces. As you can make out, Tibetan beads have quite a lot of variety compared to other bead collections. There is a 3D dragon pieces priced at about $15 for 100 pieces. There are over 400 designs in the shape of a flower. One of them is of silver finish and costs about $1 for 100 pieces. A donut shape is available in antique golden finish at a price of about $1.20 for 200 pieces. Halloween jewelry choices are available in the shape of an antique golden skull that costs about $1.75 for 100 pieces. 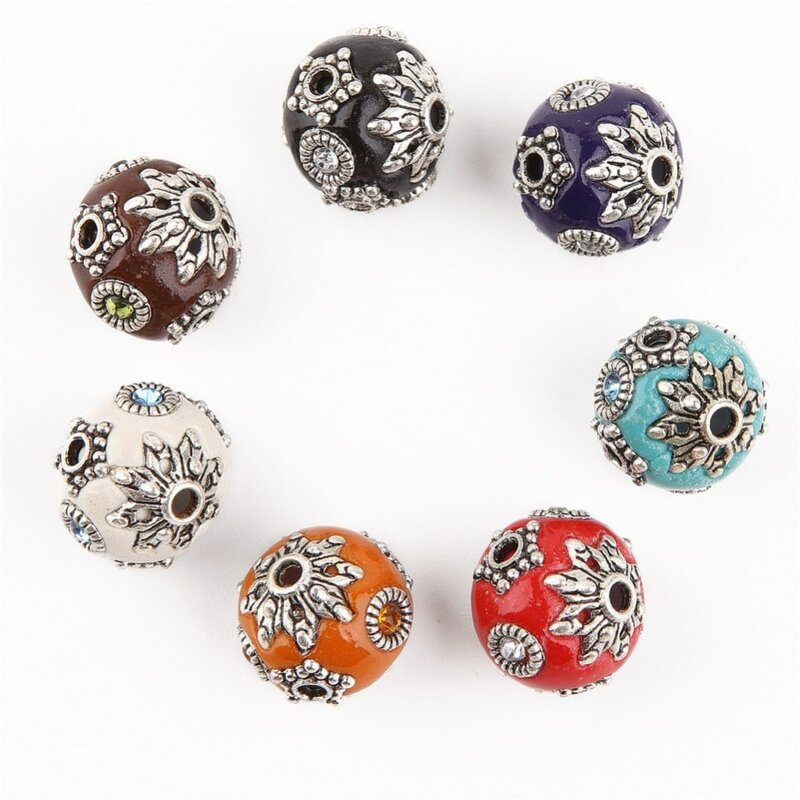 Spacer beads are available in antique silver color at a price of about $1 for 20 pieces. Another design of a skull, this time in antique silver is priced at about $2.50 for 100 pieces. A number of available models are listed as limited in quantity. There are about 530 designs listed under small lots. ​When you are looking for cheap pendants, you will discover that there is no shortage of design. In fact, the sheer number of designs that are arrayed over categories such as locket pendants and Mother of Pearl pendants are quite enough to satisfy your quest for the best shapes. There are several more categories and we start our attempt to give you the full picture with Foil glass pendants. These are made of lampwork material and the latest count reveals well over 400 designs for you to pick from. There are handmade models too with one made with lampwork together with gold sand. As you will make out, cheap pendants is just the lot that you want to dip into to find that special jewelry just for yourself. They are available in boxes with 12 pieces in each box. These round pieces have a size of 49 millimeters by 46 millimeters with a hole size of 5 millimeters. Two boxes cost about $15. If you want a smaller let you can pick another piece also handmade and also having gold sand, this time in Tibetan style. With alloy findings and a rose flower adorning it, these pieces are priced at about $3 for two pieces. Also available within cheap pendants are blown glass pieces. Within this category are leaf shapes with one handmade design of about 40 millimeters in width and about 80 millimeters long with a hole of 9 millimeters. These are made by hand and have a cost of about $46 for fifty pieces. Another piece has about 38 millimeters in width and about 65 millimeters in length with a hole also of nine millimeters. This one also made by hand costs about $69 for 50 pieces. 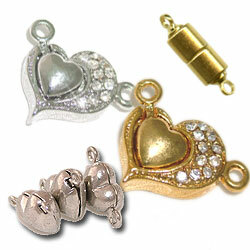 Another interesting category is prayer box pendants. A hot mover within this category is one made of brass rhinestone and is hollow with a butterfly cage. 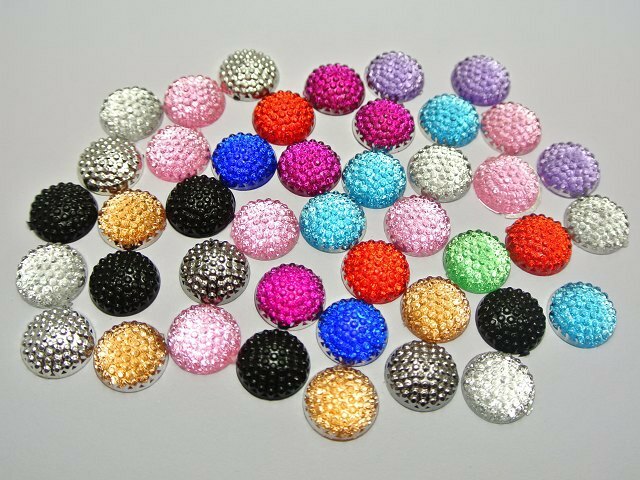 These Mexican ball pieces are colored platinum and come in a size of 28 millimeters. They come at about $12 for five pieces. Another hollow round cage in the Mexican ball model is white with a silver tone and comes with no hole. Sized about 36 by 225 millimeters, these are available at a 35 percent discount at a price of $1.90 for one piece. Other categories among the vast assortment include pieces made of iron, resin, porcelain, cloisonné and plastic. 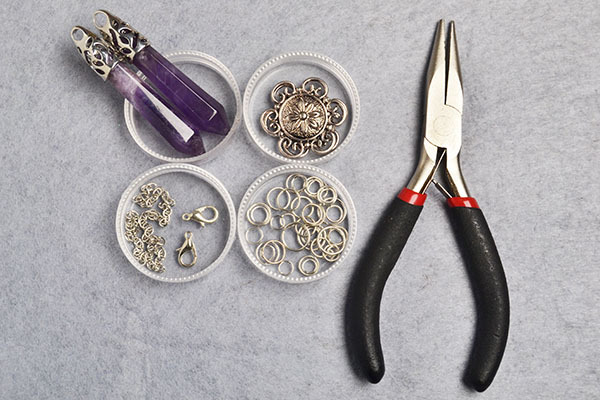 ​You can string your cabochons with thread, wire or chains. The materials that chains are made of include iron, brass, aluminum and stainless steel. 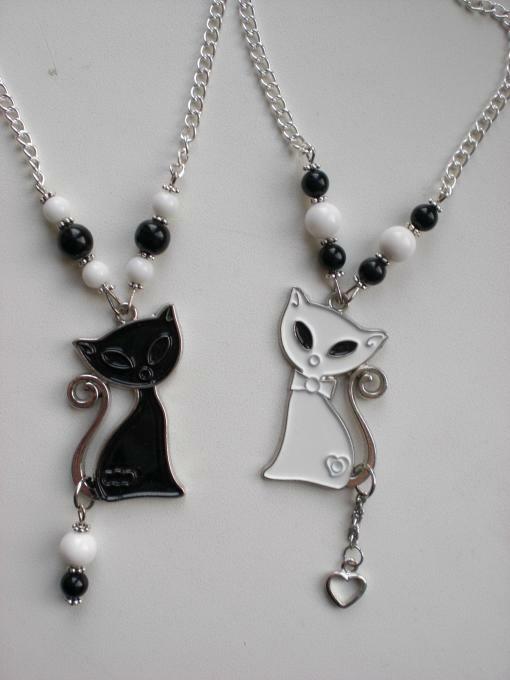 Handmade chains are also available as are also those made of alloy. There are other categories within the stringing materials such as nylon and CCB which is a plastic. CCB is a light material. Looking at one string made of CCB, you have a fantastic twisted curb model that is colored platinum. It has dimensions of width of 24 millimeters, length of 17 millimeters and thickness of 5.5 millimeters. A package of 10 meters can be bought at about $17 with further discounts available for regular buyers. One meter of this chain consists of about 70 pieces. Another string for cabochons is one made of black silk and which is handmade. This one has width of about 7 millimeters and length of about 10 millimeters. The string is about 26 inches long and about $15 you can obtain 20 such strands. Other than curb, cross chains are also available. 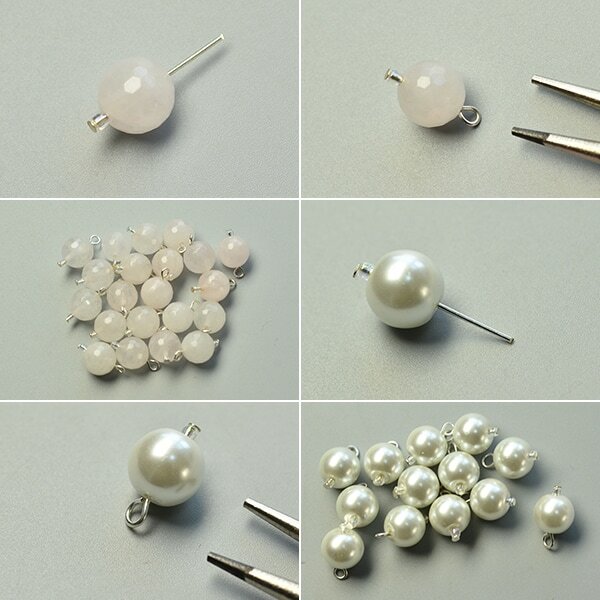 Looking at some cabochons themselves now, made of plastic is one model made of imitation pearl ABS Acrylic. This half round in the shape of a dome can be bought for $1.72 for a box of about 700 pieces. The rate goes down further if you pick up more boxes. Looking at a cat eye model, you have a square shape of about 6 millimeters in width and length and colored light blue priced at about $6 for 1000 pieces. ​A porcelain model made by hand comes in an alluring saddle brown color. It is made of crackle porcelain and has a size of 30 millimeters. For about $23, you get 100 pieces. In woven models, you can check out a piece that comes with an aluminum bottom and with the shape of a heart. Colored coconut brown and sized 22 millimeters by 33 millimeters, it has a cost of about $8 for 200 pieces. A dichroic glass piece, also made by hand is available in mixed color and is in high demand. This one has a diameter of about 10 millimeters and costs about $16 for 50 pieces. Rounding up our sampling with a piece made of shell, you get a fish-shaped piece colored in beige coming at a price of about $14 for 100 pieces. 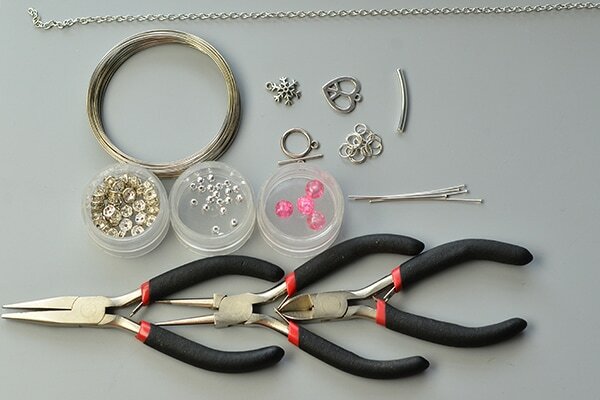 ​Snap jewelry can be made with a long list of materials as well as from alloys. One of the requirements is to avoid metals that can have negative impact such as lead. The knob has to function well to make a good and effective utility. On a piece of size 20 millimeters, the knob will be of 5 millimeter size. Zinc alloy is one among the alloys that are used. Mixed alloy pieces are also available and have rhinestones set on them in an antique silver background which makes for very beautiful pieces. These snap jewelry pieces are available in sets of 20 pieces. Zinc ally pieces have enamel rhinestones set on them in flat round pieces that can be bought in lots of 50 pieces. An interesting design is one that has a platinum tone and is made of brass polymer clay with rhinestones set on it. These are smaller in size with dimensions of 12 millimeter by 4 millimeter with a knob of 4 millimeters. The design will make you dazzle when made as a part of snap bracelets or snap rings. These are available in groups of 5 pieces. 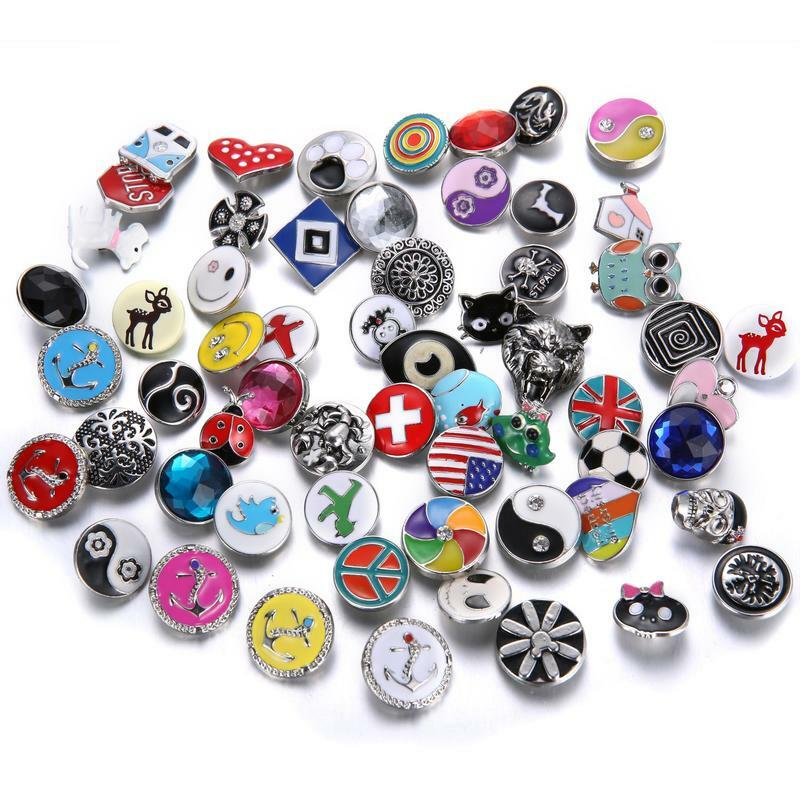 Environmental alloy is another of the alloy selections within snap jewelry. The color of the rhinestone can vary over crystal, aquamarine, jet, sapphire, light rose, hyacinth, peridot and many more. ​Looking at a sapphire model, we see a platinum tone model shaped as a dome, made of zinc alloy with sapphire rhinestones. The size of the piece is 19 millimeters while the knob is 5.5 millimeters. Another with the same platinum tone has Grade A rhinestone and enamel. There are retro models with antique silver finish with one model shaped as a birthday cake. Star, human and half round with eyes are other designs within sapphire. A half-round model with a crab on it makes up for a very interesting piece. 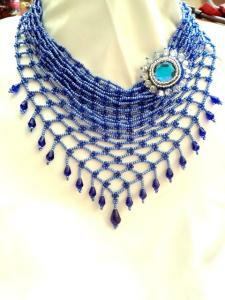 Another sapphire model has resin cabochons set alternately in between rhinestones. 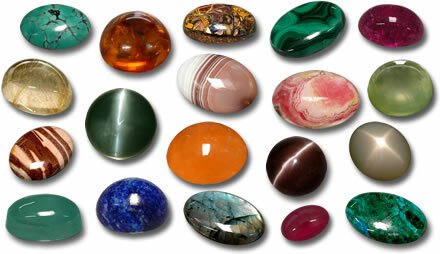 Semi-precious stones are also available in snap jewelry with gemstone, goldstone, malachite and agate pieces. One piece has an antique golden setting within which is set a square natural agate. Fifty of these pieces can be picked up for $40. 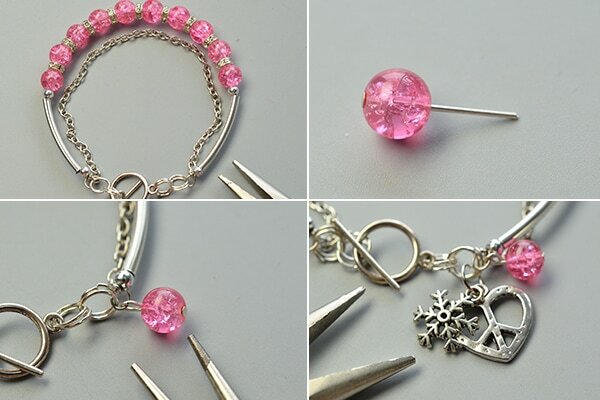 Rose Quartz is another stone, designed with a dome shape, fifty pieces of which are available at $35. Also at the same price range are black agate and Amethyst. Among the metal colors that are available is red copper which comes at a price of $27 for 50 pieces made of alloy and rhinestone. Another red copper finish is that of a brass bouton eyelet which comes in a package of 1000 pieces for a price of $70. There is a gun metal finish in the brass bouton eyelet model at about the same price while an environmental alloy piece with a rabbit on it comes in a smaller lot of 50 pieces for a price of $35. Rose Gold is another metal color that is available. Hey, dear friends, how do you like chain tassel earrings? 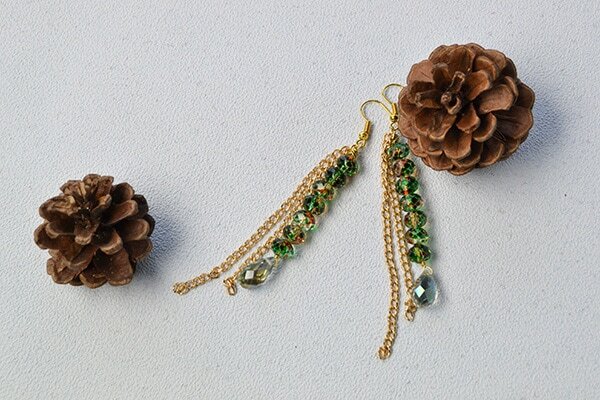 Next I will share a pair of DIY tassel earrings with you guys. It is quite easy for you to make, so if you also like them, just follow me to make a pair then! 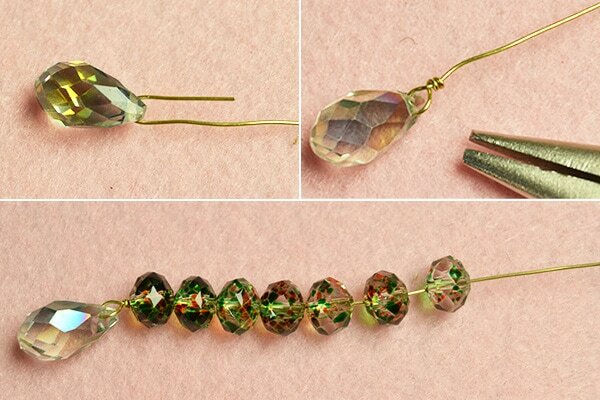 ​Step 1:Snick off a piece of jewelry wire and add a faceted drop glass bead to it, then wrap the wire to fix this bead and slide about 7 green painted glass beads to the wire. 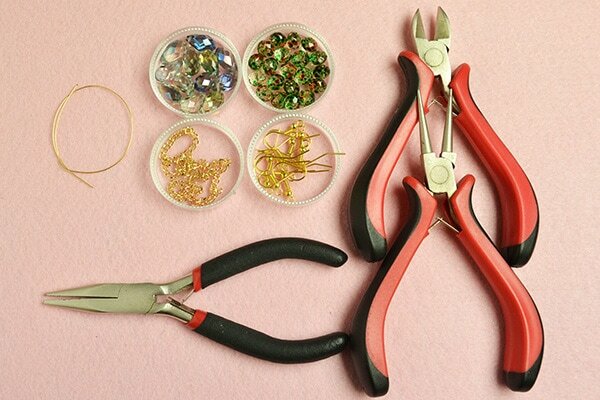 ​Step 2: Twist a loop at the end of the wire and wrap the excess wire around the loop, then cut 2 pieces of twisted chain with equal lengths and attach an earring hook with them. 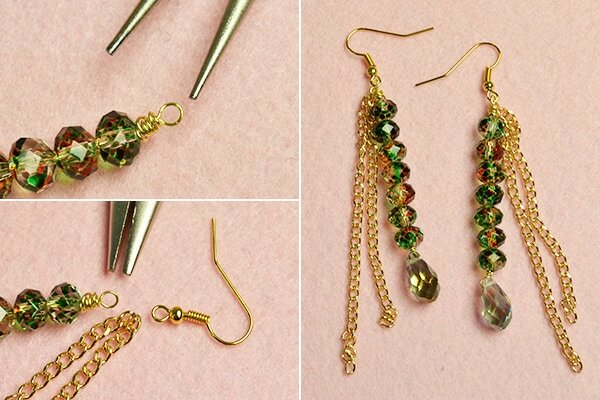 Step 3: Repeat above steps to make the other one of this beaded dangle earrings. ​Another picture of this pair of beads and chain earring. 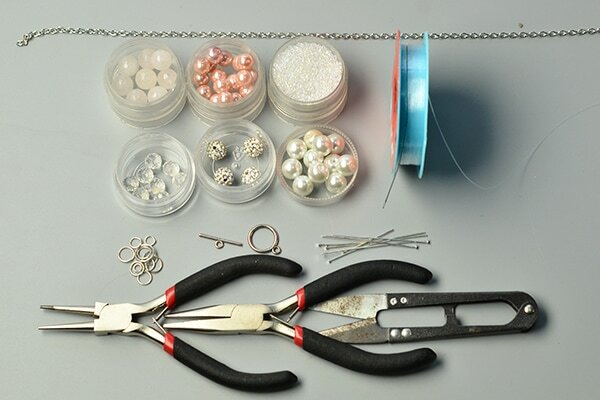 ​Do you think the processes in making the beads chain earrings are quiet easy? Yet this pair of glass beads earrings is delicate and personalized, do you like them? Have a nice try now! 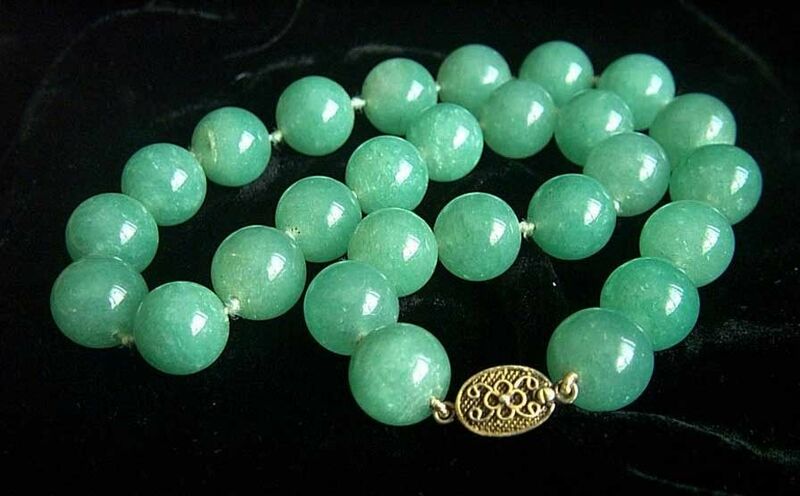 ​Jade beads come in many shapes with rectangular being one of the shapes that you would not have expected. These rectangles are 18 millimeters in length and 13 millimeters in breadth. A strand is made of 23 pieces of about 16 inches. These dyed pieces can be picked up in many color options. Three strands are available for about $12. Another shape that you would not see conventionally is that of a chip. The size of these chips vary from about 8 millimeters to 18 millimeters. They are dyed a royal blue and the strand comes to about 33 inches in length. Compared to the regular shapes of rounds and even the rectangles, these multi-sized chips have quite an attractive aesthetic about them. Twenty of these strands can be bought for about $15. 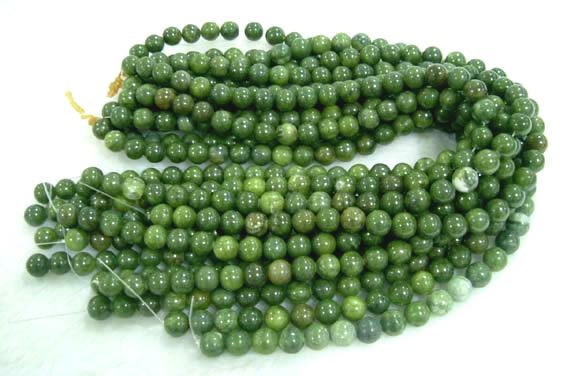 Another variation of chip-shaped jade beads comes in sizes that vary from 4 to 10 millimeters for a strand length of about 35 inches. Five strands of this model colored in imitation green turquoise cost about $4. A shape that is entirely regular is that of an abacus. Deep-pink colored models in this shape are made of natural stone and cost $15 for ten strands of 15 inches each. There are about 76 pieces in one strand. 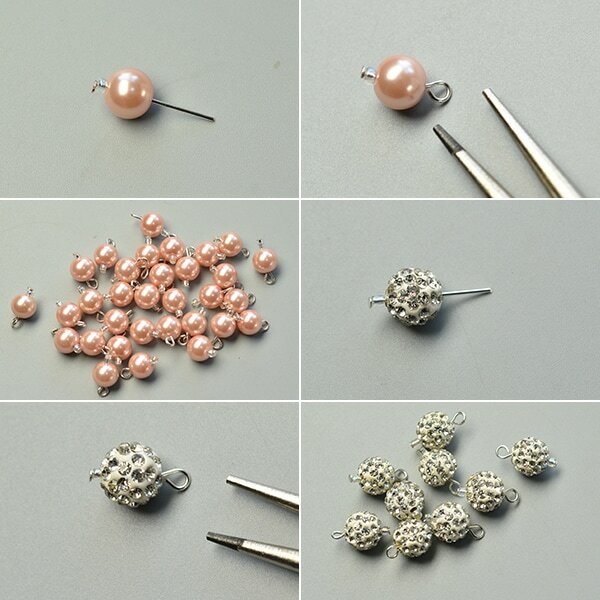 ​Step 1: Add a pink pearl bead to a headpin and make a loop at the other end of it, then repeat this process to make other more such bead patterns. Step 2: Add a ball rhinestone bead to a headpin and make a loop at the other end of it, then repeat this process to make other more such bead patterns as pictured. 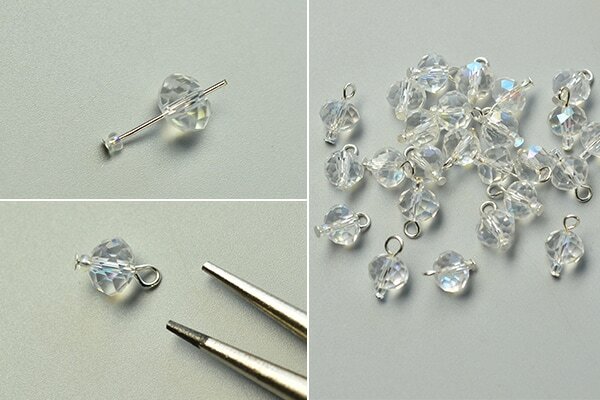 ​Step 3: Add a clear seed bead and a faceted quarts bead to a headpin and make a loop at the other end of it, then repeat this process to make other more such bead patterns. Step 4: Add a clear seed bead and a white pearl bead to a headpin and make a loop at the other end of it, then repeat this process to make other more such bead patterns as pictured. ​Step 5: Add a clear seed bead and an electroplate abacus glass bead to a headpin and make a loop at the other end of it, then repeat this process to make other more such bead patterns. 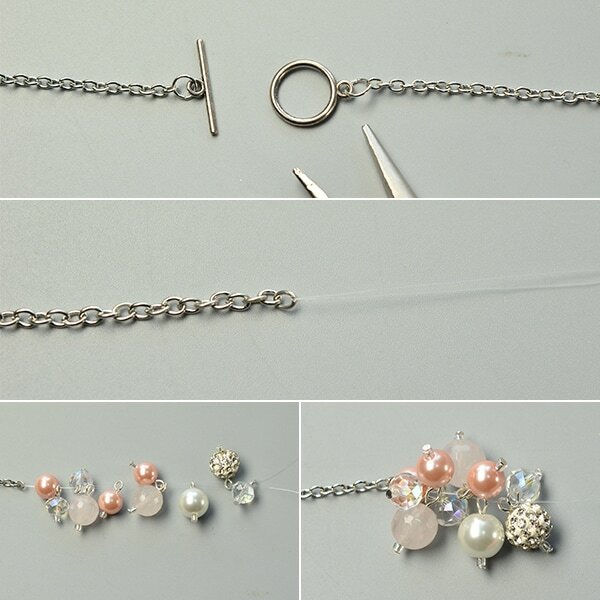 ​Step 6: Cut 2 pieces of cross chain with equal lengths and add a toggle clasp to one end of them through a jump ring. Step 7: Cut a fishing wire (with a length about 60cm) and tie it to the other end of a chain, then add some beaded patterns to the wire. ​Step 8: Add more beaded patterns to the fishing wire one by one and tie the wire to the end of another chain as pictured. 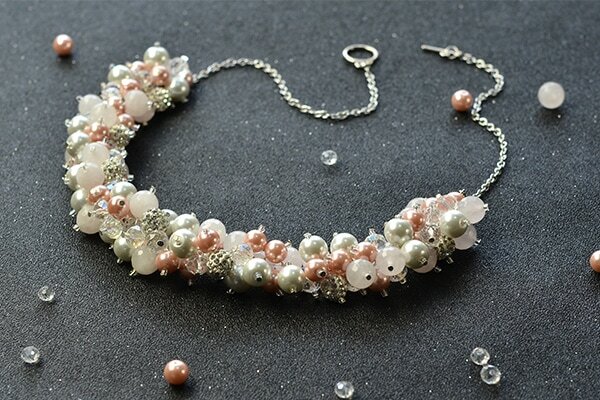 ​Now this delicate beads necklace is finished, how do you think of it? If you are searching for simple yet lovely necklace, then this one will be a good choice for you. Have a nice try!